This delicious creamy pumpkin soup gets it's creaminess from a cauliflower puree and pumpkin. 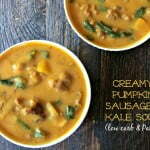 The sausage and kale make it a healthy low carb comforting soup. In a soup pot, add your olive oil and brown your sausage. Make sure to break up the sausage into bite sized pieces. Add your pumpkin, broth, kale and Better than Bouillon if using and continue to cook for a 5 minutes. Meanwhile, add your cauliflower to a microwave safe bowl and cook 10 minutes or until soft. Add cauliflower mixture to a high sped blender along with the butter and puree until smooth and creamy.